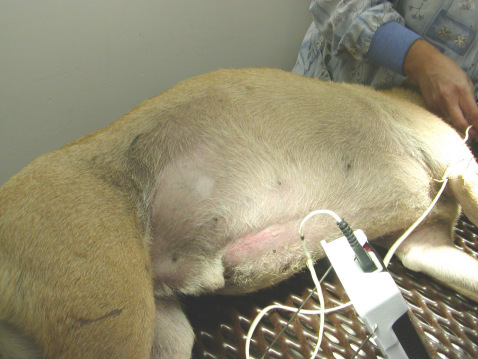 This condition is one of the most devastating acute syndromes seen in dogs. It is also known as gastric torsion, gastric dilatation-volvulus, or GDV. Torsion or volvulus refers rotation of the stomach on its mesenteric axis which results in malposition of the stomach obstructing the inlet at the cardia and the outlet at the pylorus. Dilatation refers to stretching the stomach beyond its normal dimensions. 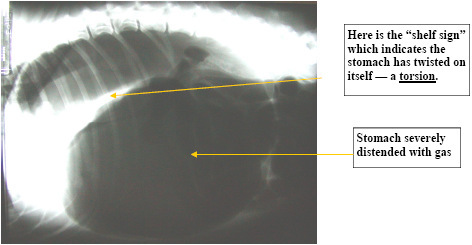 In my experience it is not uncommon to see post-anesthetic gastric dilatation without torsion in Shar-Pei. As they recover from anesthesia many have “stormy” recoveries with excessive air swallowing and salivation. Whether these go on to twist the stomach and result in GDV is unknown but I usually pass a stomach tube in these guys to relieve the distension. The mortality rate in treated animals is 30-45% and much higher in untreated cases. It is imperative that these dogs get to an emergency center as quickly as possible and therapy instituted immediately. As an owner you are faced with many decisions in a short period of time and with a financial commitment of potentially several thousand dollars with a guarded prognosis. This is a critical condition and as an owner you must act decisively to save your dog – there is no time for second opinions. The clinical presentation of bloat is an acute, progressively distending and tympanic abdomen. By tympanic I mean the abdomen resonates like a rubber kickball full of air when you tap it. These dogs are painful and there also is nonproductive retching, hypersalivation and restlessness. Sometimes the owner finds the dog recumbent and depressed with a distended abdomen or dead. Often these dogs are displaying signs of shock – weak pulses, increased heart rate, prolonged capillary refill time, pale mucous membranes and difficult breathing. Enlargement of the stomach with air, food and secretions is thought to be associated with a functional or mechanical outflow obstruction. The inciting cause is unknown but can be related to feeding, drinking, and exercise. In Shar-Pei, I have heard of bloat being associated with gastrointestinal amyloidosis. I can’t say with certainty whether this occurs or not. Trauma, ileus (paralysis of the gut), vomiting and stress are other factors associated with GDV. The gas probably comes from swallowing air although bacterial fermentation of carbohydrates, diffusion from the bloodstream and metabolic reactions may contribute. I’ve seen several cases in middle-aged Shar-Pei that have occurred in conjunction with abdominal tumors and enlarged spleens secondary to splenic infarction/thromboembolism. Once the stomach dilates normal mechanisms for removing air such as belching, vomiting and stomach emptying are hindered because the esophagus and pylorus are obstructed. No studies have supported a connection between feeding soy-based or cereal-based dry dog foods and GDV. Generally the stomach rotates in a clockwise direction when viewed with the dog on its back and the person standing at the dog’s side facing towards the head. The rotation may be 90 – 360° although 220-270° is most common. The pylorus moves ventrally and to the left and the spleen is displaced to the right side of the abdomen. These changes result in compression of the caudal vena cava and portal vein leading to decreased venous return to the heart, decreased cardiac output, decreased blood pressure and decreased perfusion. In other words all organ systems suffer and this is why GDV is such a devastating condition. Cardiac arrhythmias and reperfusion injury are often the cause of death after correction of GDV. Radiographs are necessary to differentiate GDV from a simple gastric dilatation. Blood work is seldom diagnostic. Medical management includes intensive intravenous fluid therapy, broad spectrum antibiotics, oxygen therapy and gastric decompression. Initially the stomach can be decompressed with large-bore intravenous catheters, a trocar or a stomach tube may be passed. In GDV a stomach tube often cannot be passed. Decompression of the stomach with a trocar often relieves the pressure enough to allow the stomach tube to be passed. Passage of a stomach tube does not rule out a stomach torsion. Once the stomach tube is passed the stomach should be flushed with warm water. If blood is seen in this fluid immediate surgical intervention is necessary due to the potential of stomach wall necrosis. If a stomach tube can still not be passed and immediate surgery is not possible a temporary gastrostomy is often needed. Here an incision is made in the body wall on the right side, the stomach is sutured to the skin of the body wall and a stab incision is made in the stomach wall. The contents of the stomach are removed and definitive surgery done as soon as possible. If the stomach tube can be passed but surgery has to be delayed the end of the stomach tube can be exteriorized through an opening in the side of the upper neck through the throat area. This serves as a pressure relief valve until surgery can be done. Feed several small meals a day rather than one large meal. Restrict exercise before and after meals. Limit consumption of large amounts of water after exercise. Be aware of the signs of bloat and seek medical attention immediately. With the current availability of emergency facilities home treatment of bloat is usually not necessary. Know where the closest emergency veterinary clinic is and their phone number. Calling ahead allows the staff to prepare for your arrival. Most emergency clinicians can do bloat surgery or have surgeons on call for that purpose. If you have to do home treatment for bloat I would talk with your veterinarian about putting together a bloat kit consisting of a stomach tube, mouth gag, lubricant jelly, a trocar, surgical scrub, gloves, gauze sponges and instructions on passing a stomach tube and/or placing the trocar. These supplies when properly used may allow some additional time to get to an emergency center if it is some distance away.